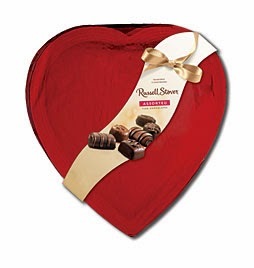 With Valentine's day approaching quickly it is now time to buy your Russell Stover heart shaped box of chocolates. There is not many things near and dear to a lady's heart then a box of chocolates. Each box has an assortment of fine chocolates. Mints , caramels, nuts and oh so much more. You can buy a 14 oz box or a 20 oz. heart shaped box wrapped in red cellophane. When selection a Valentine gift for you sweetheart you won't go wrong with a Russell Stover heart. If it is quality chocolates you are after you won't be disappointed. These are made the old fashion way, in small batches with the highest quality ingredients. The chocolate is made with real chocolate not just chocolate flavoring, same goes for peanut butter candies real peanut butter there too. Russell Stover has been around for over 90 years and there is a good reason for that. They believe in quality when it comes to their chocolates. They have been using the same recipe as they did when the company first started and their candies are still made in the USA. Not sure if many of you know that , but when these tasty chocolate first it the market the name of the company was called Mrs. Stover’s Bungalow Candies. The name was changed to Russell Stover in the early 1940's. Show your special Valentine just how much you love them with one of these heart shaped boxes of chocolates.